Tapestry Collection by Hilton continues to expand with the signing of the distinguished The Graham Georgetown, in Washington DC, slated to join the collection in early 2018. 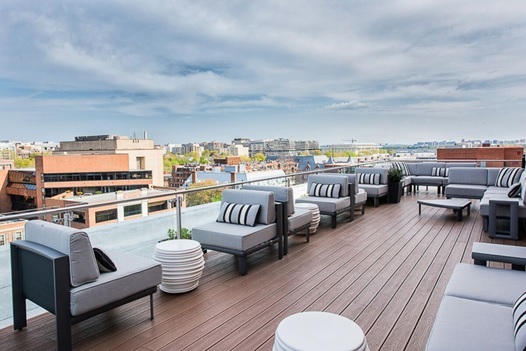 With stunning rooftop views across the Georgetown neighbourhood and its picturesque waterfront, the seven-story Federalist building is home to 57 guest rooms, including 32 one-bedroom suites with generous living space. As part of Tapestry Collection by Hilton, a growing portfolio of original upscale hotels, The Graham will continue to celebrate its authentic spirit while offering guests an independent hotel stay backed by the value and reassurance of the Hilton name and its award-winning Hilton Honors program. Originally opened in 1962 as the Monticello, the hotel’s discreet brick façade with Colonial-inspired sash-over-sash windows fits beautifully into the traditional architecture found throughout the prestigious Georgetown neighbuorhood. The property takes its name from renowned inventor Alexander Graham Bell, who pioneered countless inventions, including the telephone, just minutes away from the hotel at the famous Volta Laboratory and Workshop. To take in the historic locale, request the Frank Sinatra Suite, named after the rumored regular, featuring a 200-square-foot outdoor deck overlooking the surrounding area. From the roof down to its chic lobby, the hotel carries a look that is distinctly contemporary with a fresh color palate of earthy grays, cool blues and crisp whites, reminiscent of old Hollywood glamour. The Graham will remain open as usual during its transition process. Renovations will include updated furnishings to select areas of the hotel’s public spaces, new finishes to the lobby and an enhanced check-in and concierge experience.